During camera prep, on your cart, through colour timing or on camera, COLR enables directors, ACs, and DITs to see what they need. Multiple presets, combining CDL and 33 point 3D LUTs, can be stored on the device for quick conversion or custom looks at the touch of a button. COLR integrates with Pomfort LiveGrade Pro, giving you fine control of your looks over Wi-Fi, Ethernet, or via USB. Looks can be saved directly to COLR, and LiveGrade supports multiple simultaneous devices. COLR supports just about every camera signal on the market -- from GoPro to ALEXA. RAW or LOG signals can be converted for monitoring, and every camera's look can be synced to show directors their vision while shooting. COLR also enables wireless camera control for Ethernet-enabled cameras, including FoolControl for RED digital cinema cameras and ARRI packages. Whether your production requires industry standard colour and gamma-accurate monitors or large consumer-grade screens, COLR is compatible. Versatility is no longer a luxury with COLR’s built-in signal converter and simultaneous HDMI and SDI outputs. 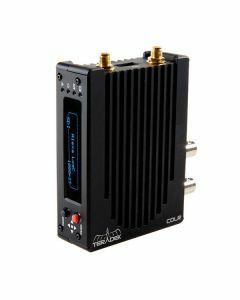 With COLR as a piece of the puzzle, the Connected Set initiative encourages seamless integration between all Teradek products, ultimately streamlining on and off-set workflows. This will support a consistent workflow throughout the production process, whether on-set with zero delay transmission, iPad monitoring, or for off-site dailies review and final colour grading. Stay ahead of the curve via free firmware upgrades and native integration with other Teradek products including Bolt, Cube, and LOKR.